We've been so deeply entrenched in the final stages of production on our latest kids app, Drive About: Number Neighborhood, that I almost forgot to mention a nice update to the award-winning Marble Math family. 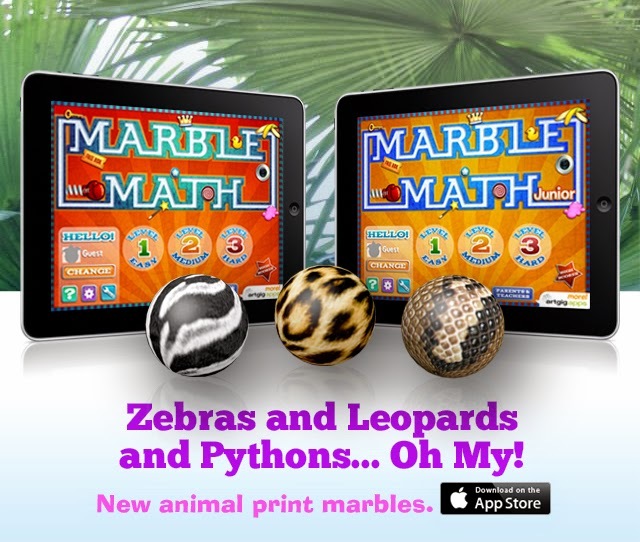 We're set to release new Marble Math and Marble Math Junior app versions this week, adding new marbles to both games. Now you can earn zebra, leopard, chameleon, parrot, python, peacock, cow and butterfly marbles. Keep your eye out for the updates in the App Store this Thursday. And stay tuned for a special Marble Math promotion this App Friday.